I bought this cookbook at a fundraising silent auction and enjoyed it so much, I ran down the North Carolina lady who wrote it so I could offer it to you. This is a 296 page book that not only has great recipes like Moma’s Christmas Dinner, but Old Fashioned Sweet Potato Pudding, Moma’s Poke Salat, Pork Chop Sandwich, Country Turnip Greens, Delicious Bourbon Brownies, White Trash, and a whole lot of the kind of stuff we ate at church potlucks when we were kids. 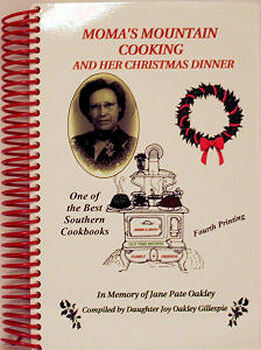 More than a cookbook, it is the story of the author’s mother, Jane Pate Oakley, born November 13, 1905. She grew up in a mountain cabin in Yancey County, Bee Log, N.C. The book is full of photographs, family history and Hints, Herbs & Remedies. 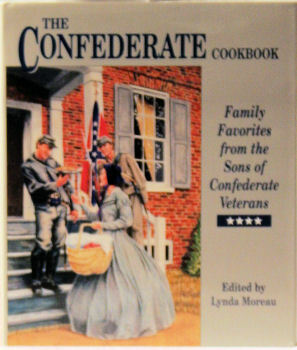 This is real Southern Heritage going back to the Civil War with it's Southern style cooking. See the Misc. page for some samples of a few recipes from these books and some of our very most favorite recipes.